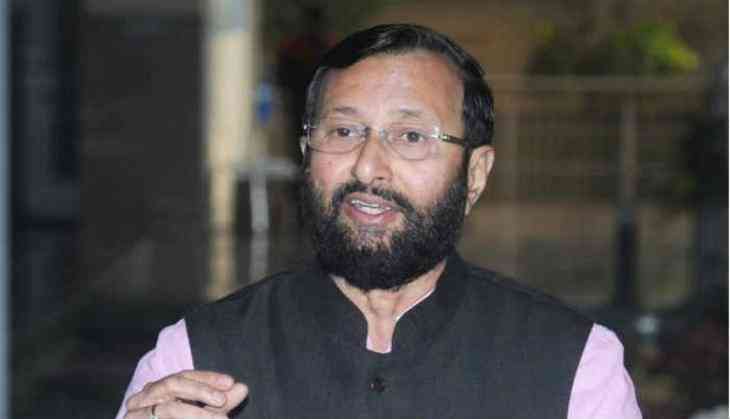 Union Human Resource and Development Minister Prakash Javadekar on Monday said Delhi's Jawaharlal Nehru University (JNU) and Kolkata's Jadavpur University did not get rankings for Parliament attack convict Afzal Guru and anti-India slogans, but for the good works done by the students. "JNU and Jadavpur University didn't get rankings for Afzal Guru and anti-India slogans but for good work done by students," Javadekar said. The HRD Minister released India Rankings 2017 of National Institutional Ranking Framework in which Indian Institute of Science, Bengaluru ranked first. JNU, since last year, has been in the fray of controversies after three of its students were booked for alleged sedition. Last year in the specific list of universities ranking, JNU was at number three and this year it has climbed in the same list to number two. Last year, on February 9, some of the JNU students organised an event in the campus to protest against the hanging of Afzal Guru, the driver of the 2001 Parliament attack. A video was leaked online in which it was seen that students in the campus of JNU were chanting 'Afzal hum sharminda hain tere kaatil zinda hai' (Afzal we are shameful that your killers are still alive). Also, the students allegedly chanted 'Hindustan tere tukde honge' (India, you will be broken into pieces). After this, there was a nationwide outrage, which forced the RSS student wing Akhil Bharatiya Vidyarthi Parishad (ABVP) to come out and protest. Sedition charges were imposed on several students and the case was lodged at Vasant Kunj police station in the national capital. A complaint was registered under 24-A (sedition), 120-B (criminal conspiracy) and 34 (acts done by several persons with a common intention). With this incident, former JNU Students' Union president Kanhaiya Kumar came into limelight as he was arrested on sedition charges after allegations were imposed on him that he had raised anti-India slogans. Many of the politicians did not appreciate of what happened in the JNU campus and there was a debate all over the news channels across India. Umar Khalid after this had again given birth to a controversy in July 2016, by comparing Burhan Wani, the Hizbul Mujahideen commander who was gunned down in July, with a revolutionary. In February 2017, Khalid was invited to a seminar at Delhi University's Ramjas College and later the event was called off and even a clash broke out between All India Students' Association and ABVP regarding this.